On July 21, 2015, Illinois officially released its Nutrient Loss Reduction Strategy designed to improve water quality in Illinois and the Gulf of Mexico by reducing phosphorus and nitrogen losses from both point sources and non-point sources, including from farm fields. 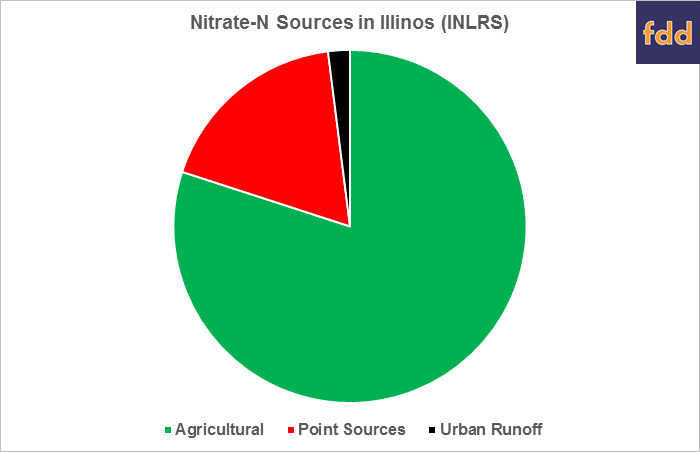 This article, the third in the series, reviews the Illinois Nutrient Loss Reduction Strategy (INLRS) as it pertains to farming and nitrate-N loss. The ultimate goal of the INLRS is to reduce nutrient loss by 45 percent as measured against the average annual loading of nitrate-N and total phosphorus as against the baseline loading of 1980 to 1996. The interim goals are 15 percent by 2025 for nitrate-nitrogen and 25 percent by 2025 for total phosphorus. The strategy seeks an equal 45 percent reduction across all eight-digit Hydrologic Unit Code watersheds (figure 3.11 from the INLRS), but given annual variability, it will measure progress towards the goal using five-year running averages. The INLRS is in response to both the Gulf Hypoxia Action Plan 2008 and the U.S. Environmental Protection Agency’s 2011 memorandum regarding a Framework for State Nutrient Reductions. As discussed previously, watersheds containing tile-drained fields were found to have larger nitrate-N yields than non-tiled watersheds (farmdoc daily March 10, 2015). The INLRS found that the average nitrate-N yield for the State was 11.3 pounds per acre, per year (1997-2011), with the highest in the Vermillion watershed at 23 million pounds per acre per year. The target for Illinois’ nitrate-N load is 222 million pounds per year, which would require a 46 percent reduction from the 1997-2011 levels; the strategy focuses on farming in northern and central Illinois. It also concluded that tile drainage explains the higher nitrate-N yields in central and northern Illinois at 19.6 to 31.3 pounds per acre per year with tile drained acres averaged 26 to 43 pounds per acre per year compared with 3.9 to 11.8 pounds per acre per year in non-tiled acres. The science assessment estimated fertilizer and manure nitrogen application for Illinois, with the lowest rates at 146 pounds per acre per year and the highest rates at 202 pounds per acre per year. These estimates were for corn/soybean rotations and they estimated 40 pounds per acre per year additional nitrogen application for corn/corn rotations (ranging from 184 to 254 pounds per acre per year, respectively). These estimates were compared to the recommended applications determined using the Maximum Return to Nitrogen (MRTN) calculator developed by Iowa State University at 199 to 189 (respectively by Major Land Use Resource Areas described as Northern Mississippi Valley versus Sandstone and shale hills and valleys). For Illinois farmers, the INLRS reviewed in-field, edge-of-field and land use change practices for reducing nitrate-N losses. 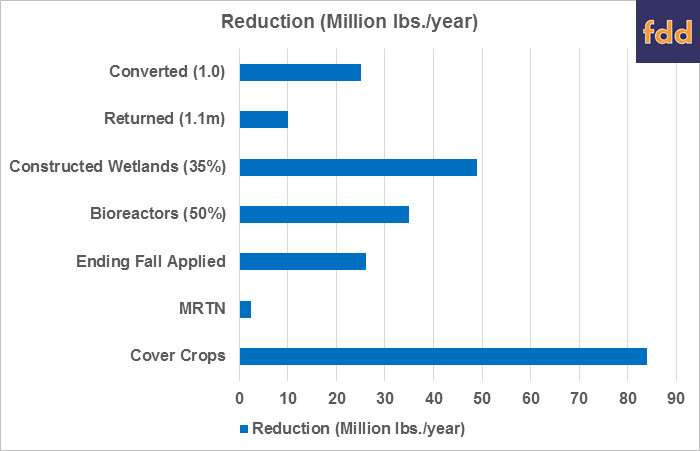 The largest nitrate-N reduction from any in-field practice was estimated to be from the use of cover crops, which could reduce losses by 84 million pounds per year if applied to all 9.7 million tile-drained acres. They concluded that having all Illinois farmers apply nitrogen at the MRTN would reduce losses by 2.3 million pounds per year, but also save farmers money; nitrification inhibitors for fall-applied nitrogen, by comparison, would cut losses by 4.3 million pounds per year. Simply ending fall-applied nitrogen is expected to reduce losses by 26 million pounds per year. Edge-of-field practices were bioreactors, wetlands and buffers. Bioreactors use wood chips in a trench at the end of the tile to intercept the water and filter out nitrates and the INLRS concluded that a conservative estimate for 25 percent removal if 50 percent of all tile-drained acres used bioreactors would cut losses by 35 million pounds per year. By comparison, constructed wetlands at the end of tile lines on 35 percent of all tile-drained acres would produce a 49 million pound per year reduction, whereas buffers along ditches and streams could reduce losses by 36 million pounds per year. Finally the INLRS looked at land use changes beginning with the 1.1 million acres of pasture that had been converted to row crops between 1987 and 2007. If those acres were returned to perennial crops, it would reduce losses by an estimated 10 million pounds per year. Converting 1 million acres of tile-drained corn/soybean acres to perennial crops could reduce losses by 25 million pounds per year. 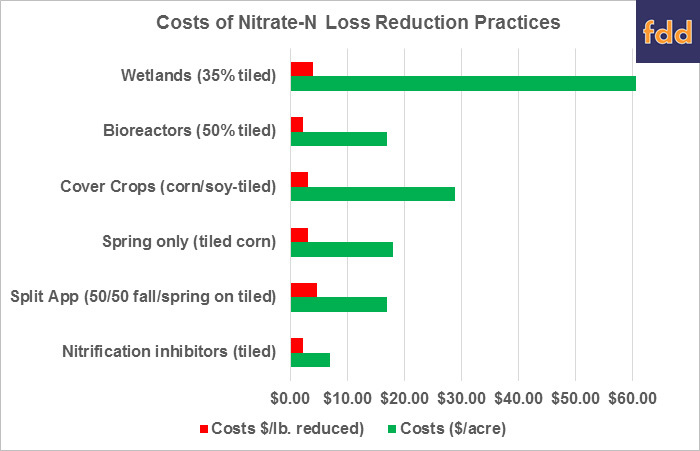 Each of the practices (other than application rates at MRTN) have estimated costs for nutrient loss reduction. For example, nitrification inhibitors cost $2.33 per pound removed and changing application timing could cost between $3.17 and $6.22 per pound removed. Cover crops, by comparison, were expected to cost $3.21 per pound removed on tile-drained acres. Bioreactors could cost $2.21 per pound removed while wetlands were estimated to cost $4.05 per pound removed and buffers at $1.63 per pound removed. Notably, these are estimated costs per pound of nitrate-N removed (or losses reduced) and not direct costs to the farmer. Appendix B of the INLRS contains the estimated costs for these practices. For example, the cost of wetlands were estimated at $60.63 per acre, buffers $294 per acre and bioreactors about $17 per acre. Reducing nitrogen rates by 20 pounds per acre was estimated to save $8 per year, but nitrogen inhibitors estimated to cost $7 per acre and split application $17 per acre. Moving fall application to spring application for all tile-drained soils would cost $18 per acre. Cover crops were estimated to cost $29 per acre, including costs for aerial application, seeds and a partial cost for herbicide application to cover additional needs beyond the farmer’s standard herbicide application in the spring. These cost estimates represent a partial budgeting approach for changes to the general practice, some have initial investment costs included (and discounted), as well as the earning potential of the land; others are estimated to impact yields. None of these practices alone, even if adopted on the widespread scale envisioned, would reach the 150.61 million pound per year reduction needed to meet the INLRS goals. Cover crops represent the biggest potential for loss reduction, but would be needed across all 9.7 million tile-drained acres; currently Illinois farmers plant only 319,000 acres. The strategy therefore looked at combinations of practices to reach the 45 percent reduction. For example, combining spring-only nitrogen application with cover crops, bioreactors, wetlands and buffers to reduce losses by 45 percent would cost $3.96 per pound removed or $728 million per year for the entire state. This was the lowest cost scenario considered. How a farmer would implement a nutrient loss reduction strategy for his or her own farm becomes the next step in this process. To do so, farmers would need to consider how to prescribe practices across the farm and, most importantly, budget for them. There are state programs and projects highlighted by the INLRS, as well as Federal conservation programs from the farm bill including the Regional Conservation Partnership Program and the Precision Conservation Management effort discussed previously (farm doc daily February 25, 2016). There is a lot of work and research to be completed and many questions to answer, especially how to prescribe at the field level and better understand the economic and financial aspects. Coppess, J. "Dead Zones & Drinking Water, Part 2: Why Tile Matters." farmdoc daily (6):47, Department of Agricultural and Consumer Economics, University of Illinois at Urbana-Champaign, March 10, 2016. Coppess, J. "Dead Zones & Drinking Water, Part 1: RCPP and Review." farmdoc daily (6):37, Department of Agricultural and Consumer Economics, University of Illinois at Urbana-Champaign, February 25, 2016. Illinois Nutrient Loss Reduction Strategy (2015), including Mark David, Gregory McIsaac, Gary Schnitkey, George Czapar and Corey Mitchell, "Science Assessment," at chap. 3, (available: http://www.epa.illinois.gov/Assets/iepa/water-quality/watershed-management/nlrs/nlrs-final-revised-083115.pdf)..